Excelling at the Craft of Writing… A New Book! Here at the Water Cooler, writers are dedicated to helping each other grow in their craft. The community that has grown over the past five-plus years is both practical and essential: it enables writers to make connections with others on similar writing journeys; it encourages creativity, collaboration, and growth; and, perhaps most significantly, it pushes each of you to become better writers. Who couldn’t do with a little more of that? In order to bring the ideas and content of the Water Cooler to the widest audience, we’ve embarked upon an exciting project: a three-part series of published books, The Best of the WordServe Water Cooler. 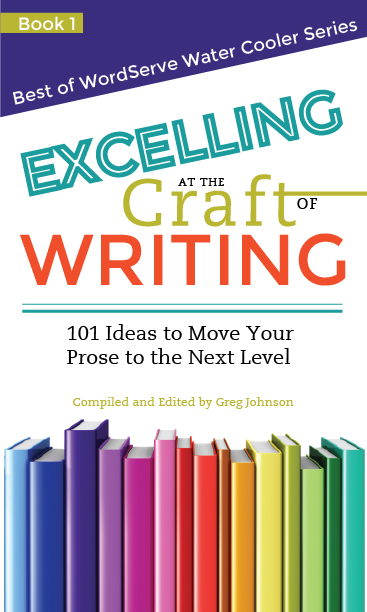 We’re thrilled to announce that the first book, Excelling at the Craft of Writing: 101 Ways to Move Your Prose to the Next Level, is now available in print and ebook! This collection of 101 easy-to-read, engaging essays covers a range of topics that include organizing and outlining your work; creating vivid characters and dialogue; and fine-tuning your language, style, and voice. With proven advice from more than thirty WordServe authors, Excelling at the Craft of Writing moves from the first seeds of starting your writing project up to the last steps of creating a proposal and pitching your work to agents. It’s going to be a must-have resource for writers at every stage! Many of you are already familiar with this book, having generously allowed us to include one or more of your posts in the manuscript; many more of you will be contacted for inclusion in the upcoming two books, on marketing and the writer’s life respectively. We hope that you’ll all want to participate in helping to promote the books, which should bring the work of the Water Cooler—and all of you—to a wider audience. That’s why we’re offering a special promotion for Water Cooler readers. If you’re willing to promote Excelling at the Craft of Writing by advertising it on your site with a widget or dedicated post; tweeting it out to your followers; or posting on Facebook, we’ll send you a FREE digital version of the book to read on your e-reader device. If you’re willing to help promote, please contact keely@wordserveliterary.com to tell us how and to receive your free book. We’d also like to take this opportunity to thank all of the writers who allowed us to include their work in Excelling at the Craft of Writing, as well as all of you who have written and continue to write for the Water Cooler each month. We couldn’t do it without the dedicated involvement of so many great writers, and the blog’s success is a testament to your thoughtful, incisive, and intelligent posts each week. Thank you for being a part of this community! This entry was posted in Agent's Desk, WordServe News, Writing Craft and tagged craft, excelling at the craft of writing, Greg Johnson by keelyboeving. Bookmark the permalink. I'm an Associate Agent at WordServe Literary. I also do freelance editing and ghostwriting for a variety of clients. You can find me at www.keelyboeving.com.